On Saturday, I was lucky enough to join the ladies of the Dallas Modern Quilt Guild again for the monthly Saturday Sew. This was my second time to attend and it's really a fun way to spend a day. I highly recommend it if you are in the DFW area and would like to join the coolest quilt guild around. First, I finished up my signature swap blocks which I mailed out today. I'd show you a photo, but I left my camera (with the photo on it) at my mom's on Sunday, so I'll have to wait until I go fetch it. 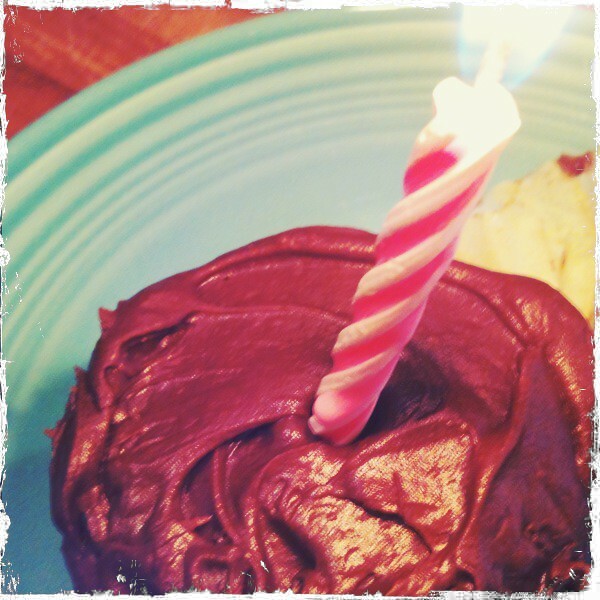 For today, I'm stuck with iPhone Hipstamatic photos. After I finished my signature blocks, I made a super scrappy Wild Flower Pincushion using the 1/2" hexagons I started on when I thought my swap pincushion was a flop. I ended up sending my partner the second red and white pincushion, so I guess I'll just keep this one. (Yea!) It's filled with walnut litter (crushed walnut shells) and I love the weight. I bought a seven pound bag in the bird section at Petsmart. The body of the pincushion is linen. I'll take a better photo after I retrieve my camera. My birthday was Sunday. My mom made me some yummy cupcakes. Shea assures me I don't look my age, but she may just be saying that to make me feel better. She told me her friend thought I was "like 29", so that made my day! Yea, I was 29. Almost 10 years ago! This year, I decided to be extremely blunt with my sometimes gifting-impaired husband, bless his heart. I told him he had two choices, a new dress form, or FQs of AMH's Little Folks voile. He said he thinks I have enough fabric (I have no idea what he's talking about!?! ), so he wanted to get me a new dress form. I've had about four dress forms, but I've never had a really nice one. My favorite dress form to date was the one he helped me make from duct tape in 1993 when I was in college. I just threw it out last summer when we moved so I've been without for almost a year and I really miss having one. We had to order the dress form, so I picked up my own gift on Saturday so he could give me something on Sunday. I'm so thoughtful like that! A 24 pack of Sharpies with bonus Caribbean colors! Woo hoo! Sharpies rule! Thank you for the kind comments on the cheater print. I really hope it prints up nicely. The voting at Spoonflower doesn't start until July 7th, but I'll post about again when it's time. Love the pincushion and the sharpies!! Happy Birthday!! I had mine last week and I had to make myself some chocolate brownies, everyone else likes vanilla, blah. I love sharpies too. I think I bought myself that same pack. Happy Birthday! Glad to know I'm not the only one who loves Sharpies. The pincushion is great. I stuff mine with the same stuff (haha). Sharpies rule. I should buy stock. I had never heard of a duct tape dress form but saw someone make one last summer. Cool. I didn't realized that you lived so close to Dallas. I grew up there and my dad just moved from there to East Texas! I LOVE and MISS Dallas and all of my friends there! And, I am so jealous because that quilters guild sounds fantastic. Happy Belated Birthday. Glad that you got what you wanted for your birthday. I don't think husbands have a clue as to what we'd really want. I think the dress form is an excellent choice. And doesn't he know there is never enough fabric??? Happy Birthday! I thought you were much younger when I met you at Houston Street in Granbury...with that said, I just had a birthday and turned 40. I think we were at TCU at the same time? I graduated in 93'? Happy Birthday! I enjoyed spending time with you on Saturday! I'm WAY older than you, so in my eyes you are super young! I have a granddaughter who's almost the age of your daughter! See you at the next DMGQ meeting! Always best to give you other half very clear instructions where birthdays are concerned! Love your pincushion with the teeny tiny hexagons and happy birthday! Sharpies do rule! Your pincushion is darling too - isn't that walnut litter fabulous for pincushions - it gives such a great weight to the piece. Happy birthday to you!! I'm contemplating buying a new dress form as I'm vaguely thinking of making my wedding dress, and it's the one time I think I'm really going to NEED one! Happy birthday! 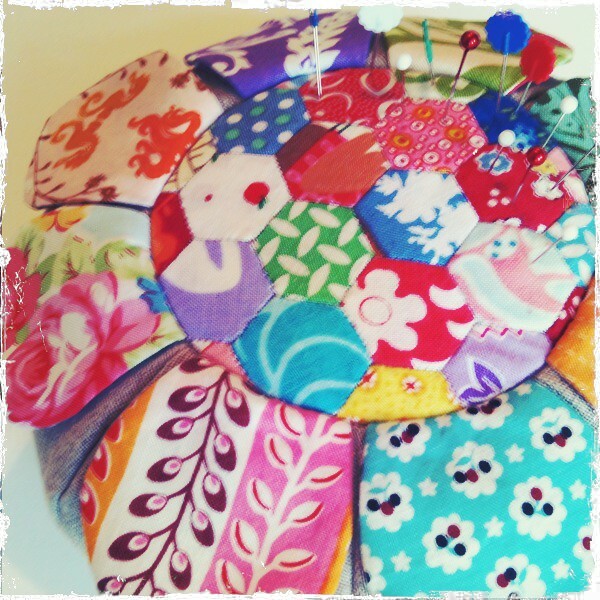 Your wildflower pincushion is fabulous! Freckles - so nice to hear that someone else has a gifting-challenged husband! Happy birthday whatever the count is! Glad you had a happy birthday...i am loving all your hexagons & that cheater cloth! A late happy birthday, Melanie! I love your hexagon tutorials, just had to tell you! I am working on a hex quilt myself, and guess I have caught the bug already... Love your scrappy, gorgeous selection! The hexagon pincushion is also super cute!! Did I say your color wheel quilt is delicious? I too love Sharpies! 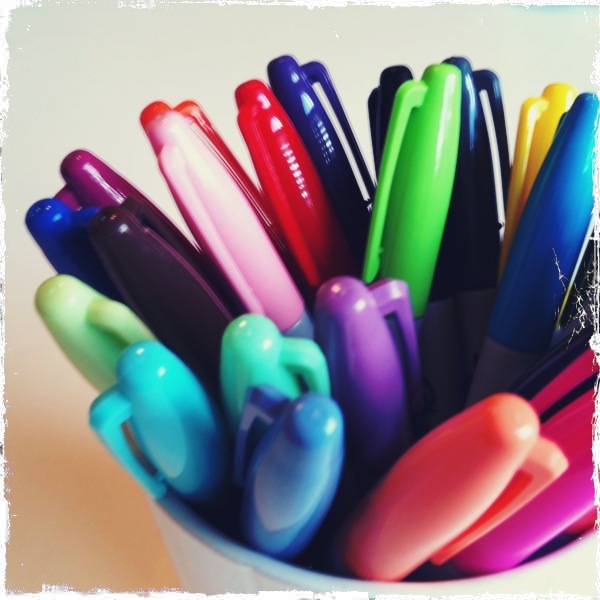 Have you tried the Sharpie pens? Have too!